For best planting and growing results, break up and blend the soil with a big rotary tiller. Don't worry about it's ruggedness. It's husky, non-clogging- tines are guaranteed against breaking. Standard width is 32 inches, but you can add extensions for a big 42-inch tilling swath. After the plants have come up, the rotary tiller can be used for cultivating. ** A new hood assists the husky non-clogging tines in breaking up and blending soils. The tines are guaranteed against breakage. The rototiller is PTO driven from the rear of the tractor and incorporates its own PTO clutch. Depth is controlled by the implement lift system to a maximum of 9". Free-floating action is automatic. 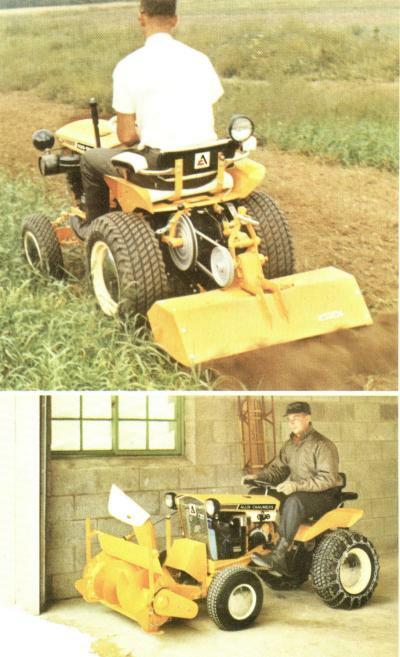 Standard rototiller width is 32" with two optional tine and hood sections available to a maximum of 42". The tiller may also be used for in between row cultivating. Either a ground speed reduction pulley or hi-lo transmission is recommended. This 36-inch snow thrower can chew its way through a ton of snow in ,just 60 seconds and throw it more than 30 feet away, leaving no high banks to encourage further drifting. ** The snow thrower is a direct action machine. The single high speed auger is fed by the forward motion of the tractor, compresses snow and slings it up to 40 ft. away. The arc of discharge is adjustable from 0° to 78° and the discharge chute is rotated from the tractor seat 270°. The single belt drive and drive clutch are completely shielded from ice and snow. Drift cutters, adjustable skid shoes, and replaceable scraper edge are standard equipment. Capacity is 1 ton of snow per minute.